Howaboutwe.com is a really cool dating website, and with a recent string of disappointment dating site reviews for me, it’s a nice change of pace to actually find a dating website with some original and innovative to bring to the table. 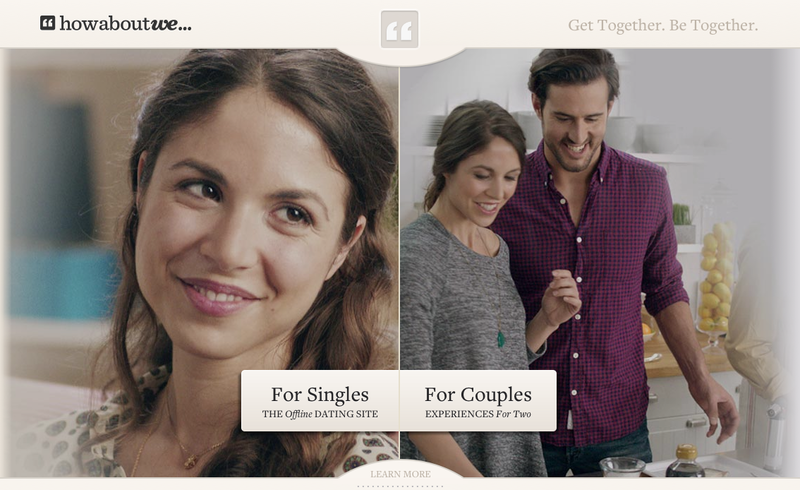 The site has you crate “Date Ideas” (hence the proposition that is the site’s name, how about we…?) where you suggest a place and an activity and other members will see your suggestion and if there interested you can go on that date. Some people suggest some pretty unoriginal, everyday kind of stuff like ”How about we… bring a blanket and a deck of cards to Central Park and play gin rummy” but some people come up with some pretty adventurous sounding date ideas like “How about we… Make up a dance routine and perform it at Grand Central Station”. They also have some pretty hilarious propositions as well, an example being “How about we… dress as Batman and Robin? You would have to be Robin I’m afraid.” With myself living in the greatest city in the world New York there is probably more than a million date ideas to come up with so you can spend hours looking at suggested dates and never see two that are the same. The site also provides its own date suggestions and provides discounts to the restaurants, shows or attractions that they suggest you visit. The account set-up is fun, instead of asking you the same old questions like “What is your ethnicity?” or “What are your religious beliefs?” they ask questions like “What is some obscure knowledge you posses?” or “Where are some cool places you traveled?”. The site also asked me “What is your ideal Sunday?” to which I answered, watching movies and then the next question it asked was “What is the movie you have watched the most times?”. Now I don’t know if that was coincidence or intentional but it was pretty cool regardless. The site boasts that it’s the best place to meet people ”offline” since they want to get you out there doing things and meeting people face to face, that’s an idea I won’t argue with. - Profile pictures are a mandatory requirement so you won’t have to look through a list of faceless member profiles. - If you provide your cell phone number the site will send you a link to download their mobile app for free so you can post your date ideas as they come to you on the go. - Browse by Dates, People, Trending and Recommended. You can select if you’re interested in a person or a suggested date or choose to send another member a message. - The site provides 5 “Daily Dates” which are suggested by a member, it also shows you some brief info from their profile page and asks you to select if your intrigued or if you want to skip it by selecting next. - Under the tab “People” you can choose to view Recent Activity, Nearby or Newest which is similar to a live stream of user activity on the site and it also tells you if that member is online at the time. - The site has a page they call the “Date Report” which has everything from articles suggesting good dates spots, dating advise or suggested literature on the subject of dating. - You can do an advanced search and find places or things to do on a date that have already been proposed by a member. - You can invite 3 friends by providing their email addresses to use the site and gain access to features that you would typically need to upgrade to be able to utilize like visitors to your page or the ability to send a message to another member. Receive and read unlimited messages. Read new messages right in your email. See when your messages have been opened. Get featured as a subscriber on the search page. 100% Offline Guarantee. 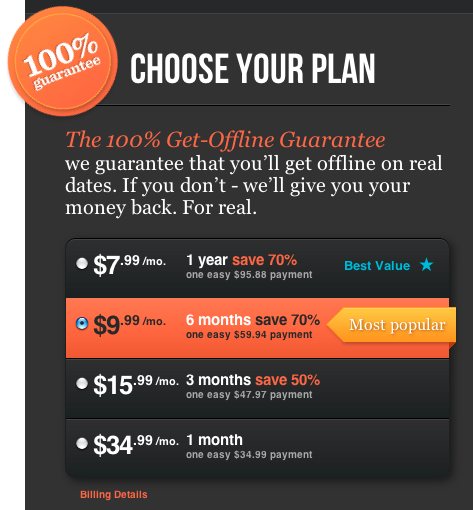 If you don’t get offline on real dates, we’ll refund you. Super easy to turn off billing renewal to avoid unwanted payments. Really. With all the ups must come the downs. I love the idea of creating your own ideas for dates but the site also has a feature where you can select “surprise me” and it will fill out a date request for you and the suggestions aren’t half bad. It’s just that it seems a lot of people have done this so there is a bit of repetitiveness when it comes to date ideas. You’ll see lots of different Ideas, but then you’ll stumble upon the same one you’ve seen 10 times word for word. The site doesn’t allow you to see the messages that other member have sent you. They tease you by showing that you have pending messages but then tell you need to upgrade in order to read them. You also can’t see who has visited your profile, they show you that someone has but then tells you to upgrade, although with this feature you do have the ability to provide 3 email addresses of you friends so they can send them a link to the site and after which they allow you to view who has viewed you. HowAboutWe.com was a lot of fun for me to use. I love discussing places to eat and cool new places and things to do around the city and since I am a resident of Manhattan I can’t imagine a better place in the world to participate in. Although I did get a sense that this website may be some sort of genius marketing ploy to promote local businesses, it’s not like anyone is saying “how about we…go shopping at Wal-Mart and then go get some Big Macs from McDonald’s” that might be a bit obvious and it’s not like either of those companies need the promotion. It just seems like a great way to promote mom and pop type shops in your local city and get some people in the seats. The site is really fun to use and I think anyone will have a great time coming up with date ideas and then hopefully finding someone to go one the date with them.